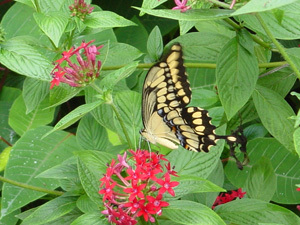 Pentas lanceolata is, as you can see from the photo, loved by butterflies, hummingbirds, bees and other nectar gathering insects. The attractive bloom clusters come in red, pink, purple, lavender or white. This is a favorite in hot weather gardens. They do best in full sun, but part shade usually works too. They have a long blooming period from spring through fall and often into winter. Propagation is by seed or cuttings. They are slightly salt tolerant. This is a low sprawling plant, up to 36", that can be treated as an annual where frost can kill it to the ground.